Adam Hall and his Aberdeen IronBird teammates concluded the 2018 season with an 8-7 win over the Hudson Valley Renegades. They finished the year with a record of 38-37, the second winning season in a row. One of the most heated defensive games of the year came at Brooklyn on July 5th. Hall and Doran Turchin made two incredible defensive plays back to back to shut them down in the 7th with the bases again with no outs to help Aberdeen get a 2-1 win. With 22 games to go, Aberdeen was 10.5 games out of the New-York Penn League Wild Card Race, but the fightback started with seven straight wins. Across the streak Aberdeen outscored there opponents 45-16 and had a blast doing it, with Hall on his streak. From August 4th until August 28th, Hall went on a historic tear through the league. He had hits in 19 games in a row, with a .456 batting average and a .526 on base percentage. 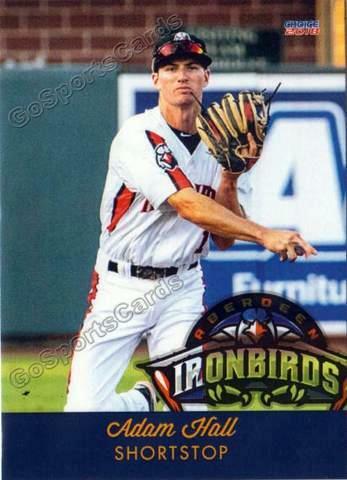 Across the run he had four doubles, two triples and his first homer as an IronBird along with 12 RBIs. He struggled to start the season with a batting average as low as .179 on July 7th, but finished the year at .293 and showed us all why he's a top prospect. As a team the IronBirds finished the year 38-37 with a .507 winning percentage. They hit .248 at a team (4th in the NYPL) with a 3.81 ERA (12th). Hall finished 3rd in the New York-Penn League Triples with 3 and he would finish 2nd in the League with 22 Stolen Bases.